... 1981 (30 years ago today), was promulgated the Loi du 9 octobre 1981 portant abolition de la peine de mort (image credit), by which France abolished the death penalty. The law took effect on this day, consequent to its approval by both houses of the Parlement -- by votes of 363 to 117 the Assemblée nationale and 160 to 126 in the Sénat. 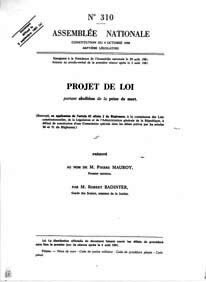 As demonstrated in this chronology, this marked the 2d time France had abolished capital punishment, and even after 1981 some in France called into question the propriety of the policy. France has not ratified the European treaty categorically forbidding capital punishment.